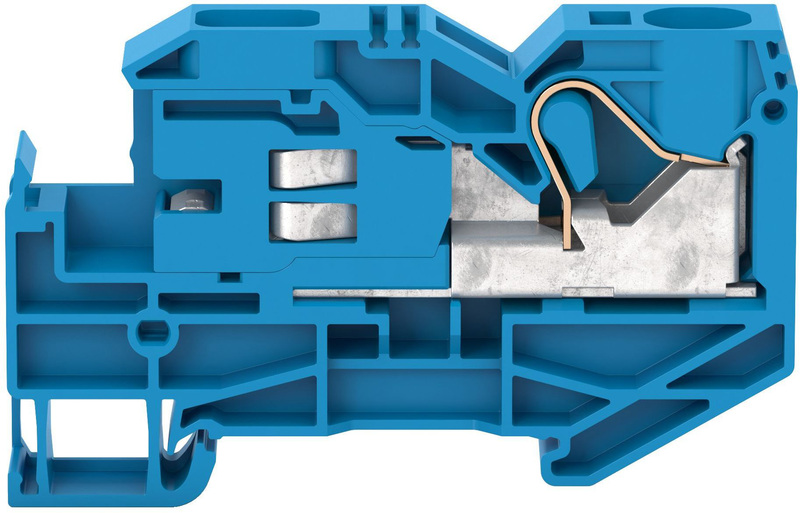 Conta-Clip has expanded its range of single-level push-in installation terminals, adding the FNT 16 neutral disconnect terminal for wire cross sections between 2.5mm² and 25mm² (up to 16mm² with wire-end ferrules). The push-in connection system allows for safe connection of wires without tools. When a solid wire or ferrule is inserted, the pressure spring opens automatically and establishes a secure contact. Standard screwdrivers can be used to connect and disconnect flexible wires without ferrules. The disconnect terminal integrates a receptacle for the 10x3mm neutral busbar. There is no need for an additional fixing plate. The neutral busbar is securely connected via a screw-less slider. Like FRKI feed-through terminals and FSLI PE terminals, the neutral disconnect terminals can be used alongside FDLIS three-level installation terminals, because the position of the neutral busbar is identical in both versions.